The St. Croix Valley has been a haven for farmers since the first boom in the 1850s. The St. Croix River was a mecca for early industry, and the vast Minnesota and Wisconsin prairies have provided the natural resources for the region's farmers to grow their crops and their families. The valley was dotted with brightly painted barns, a sign of economic success. However, as time wore on, the St. Croix Valley experienced an agricultural downturn. Barns have been left abandoned. Fields have been turned into subdivisions. An era has passed, and the barns and farms that were once proud reminders of the region's success are disappearing from the countryside. But why? 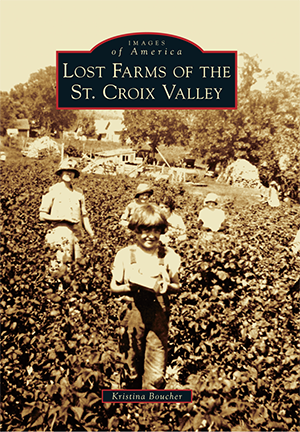 Lost Farms of the St. Croix Valley explores the history of the region, shares the photographs and stories of local farmers, and evaluates why the traditional family farm is falling by the wayside. Kristina Boucher has lived in the St. Croix Valley her entire life. She has many fond childhood memories of the Boucher family farm, which inspired her interest in photographing vintage barns and learning local history. Boucher graduated from Osceola High School in 2011 and is currently a college student and volunteer blogger for the St. Croix County Historical Society.